The stick is very lightweight and perfectly balanced. It's especially Mega Blade 2 and Dimple Carbon Kevlar shaft, an ultra-light, die-molded Kevlar-Carbon shaft with patented Dimple design. (Dimple - hole, dimple). Dimple technology improves torsional rigidity, increased penetration shots and faster reaction rods. Rod is thanks to this technology is ideally balanced and more streamlined kick point - a point dents, which imparts maximum power to the missile. With specially shaped surface of the rod is less air resistance and is due to savings in material, compression molding, generally lighter and stronger, which helps fire and the overall work of the balloon. 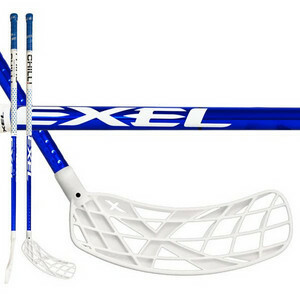 The stick is equipped with a new two-piece grip.